Euronext Paris calculates a family of indices. The CAC 40 is the exchange's benchmark, disseminated in real time. Its components are included in the broader SBF 120 Index, a benchmark for investment funds. The SBF 250 index, a benchmark for the long-term performance of equity portfolios, includes all of the SBF 120; it is structured by sector. The MIDCAC index includes 100 of the most liquid medium-size stocks on the Premier Marché and Nouveau Marché calculated on the basis of opening and closing prices, while the Second Marché index focuses on that market. Both indices are benchmarks for funds. The Nouveau Marché Index represents stocks in the growth market. The SBF-FCI index is based on a selection of convertible bonds that represent at least 70% of the total capitalization of this market, calculated twice daily. For derivatives, MONEP trades short-term and long-term stock options and futures and options on a family of Dow Jones indices. MATIF's products include commodity future and options on European rapeseed and futures on rapeseed meal, European rapeseed oil, milling wheat, corn and sunflower seeds; interest rate futures and options on the Euro notional bond, five-year Euro and three-month PIBOR (Paris Interbank Offered Rate), and futures on the 30-year Eurobond and two-year E-note, and index futures on the CAC 40. 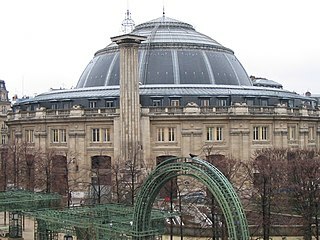 ^ "Cours, Bourse de Paris". Euronext. Retrieved 1 January 2016. ^ "T+2 Standard settlement Lifecycle update". Euronext. 2014-07-28. Retrieved 2015-02-28. The CAC 40 is a benchmark French stock market index. The index represents a capitalization-weighted measure of the 40 most significant stocks among the 100 largest market caps on the Euronext Paris. It is one of the main national indices of the pan-European stock exchange group Euronext alongside Brussels' BEL20, Lisbon's PSI-20 and Amsterdam's AEX. A stock index or stock market index is a measurement of a section of the stock market. It is computed from the prices of selected stocks. It is a tool used by investors and financial managers to describe the market, and to compare the return on specific investments.